LOS ANGELES, CA. (via Pera Padala) – Antonio Margarito stands to pay dearly for his refusal to quit before his 12-round fight with Manny Pacquiao ended Saturday night at the massive Dallas Cowboys Stadium in Arlington, Texas. The three-time world welterweight champion is scheduled to go under knife Tuesday, if his condition permits, at the Dallas Methodist Hospital to repair his fractured eye socket he suffered from absorbing severe punishment from the Filipino ring hero, who won a 12-round unanimous decision for the World Boxing Council super-welterweight crown. Promoter Bob Arum. Arum, in a chanced meeting with this reporter Sunday morning, said the operation can’t be performed until the swelling on the eye has reduced. 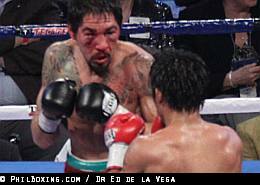 Pacquiao exploiting his quickness proved for Margarito to handle as the Filipino southpaw landed fast, powerful combinations right after the two fighters met at the center of the ring and inflicting an ugly cut under his right eye as early as the fourth round. Despite egging from Pacquiao himself at the end of the 10th, when the cut grew several inches long and his other eye puffed up as well, referee Laurence Cole refused to stop the punishment. Neither ring physician Manuel Gonzales did. Gonzalez, who repeatedly checked on Margarito’s damaged eye starting in the fourth, said he did not recommend stoppage because he sensed Margarito could still see. Even Margarito’s trainer Robert Garcia said the fighter would not allow him to stop it even if he wanted to. Pacquiao actually started pointing out the damage in the ninth round, but Cole did not stop the fight. Arum said Margarito’s team, including co-managers Francisco Espinoza and Sergio Diaz, remained in Dallas with him and will fly home to Southern California together probably on Wednesday, should the surgery is completed and he is released. Arum allayed fears expressed by some quarters that the injury could career-threatening. Pacquiao, in scoring his 13thstraight victory since the last of his third losses against another Mexican, Erik Morales, has retired Oscar De La Hoya and Ricky Hatton on the way to an unprecedented eighth title in eight separate divisions. Arum, meanwhile, announced that the pay-per-view results could be announced Thursday although he expected to get a preliminary number based upon satellite sales by Tuesday afternoon. Pacquiao is guaranteed to earn $15 million from the fight that could swell to more than $20 million from the pay-per-view sale. A $3 m guarantee price awaits Margarito not counting his PPV share.